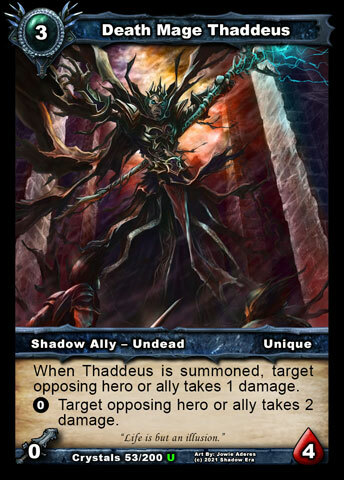 Greetings, players of Shadow Era. 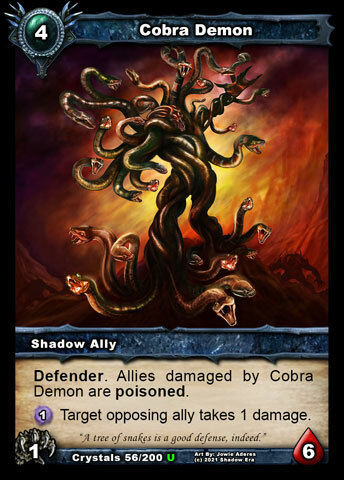 It's Gondorian here, Shadow Era TCG Head Designer, and I'm back to continue our new spoiler series for Lost Lands part 2, which will be focusing on each of our seven classes in turn. Last time, we had a look at Warriors (click here if you missed it). 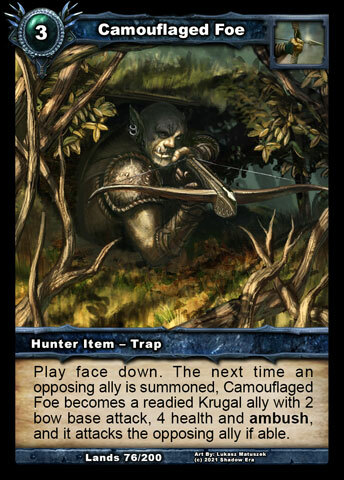 This time, it's the Hunters that have become the hunted and we have seven of their upcoming cards in our sights. 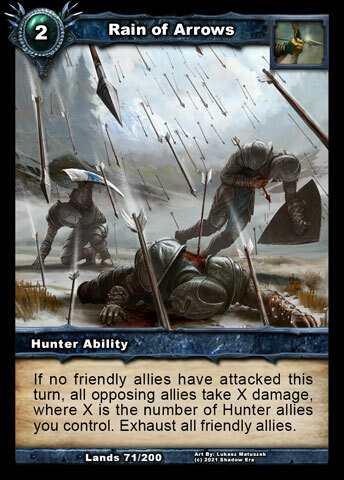 Rain of Arrows - 2cc Hunter Ability - If no friendly allies have attacked this turn, all opposing allies take X damage, where X is the number of Hunter allies you control. Exhaust all friendly allies. 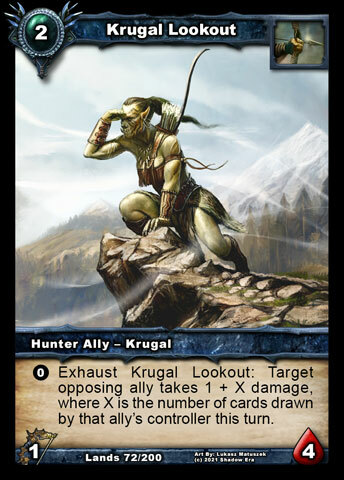 Krugal Lookout - 2cc Hunter Ally - Krugal - 1bow/4HP - 0: Exhaust Krugal Lookout : Target opposing ally takes 1 + X damage, where X is the number of cards drawn by that ally's controller this turn. 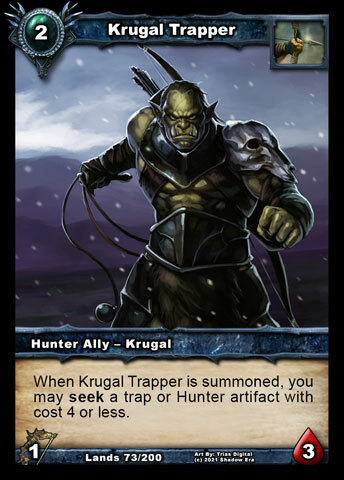 Krugal Trapper - 2cc Hunter Ally - Krugal - 2bow/2HP - When Krugal Trapper is summoned, you may seek a trap or Hunter artifact with cost 4 or less. 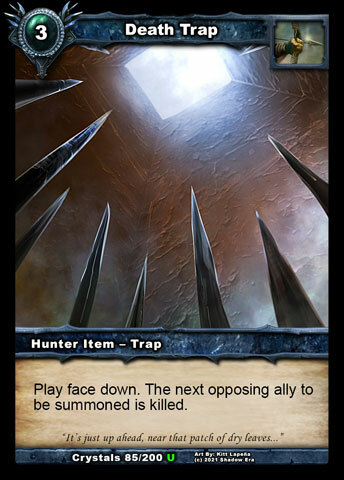 Hunting Party - 2cc Hunter Ability - If an opposing ally has been killed this turn, draw a card for each Hunter ally you control, to a maximum of 3. Sneerkrug - 3cc Hunter Ally - Krugal - Unique - 2bow/4HP - Defender. 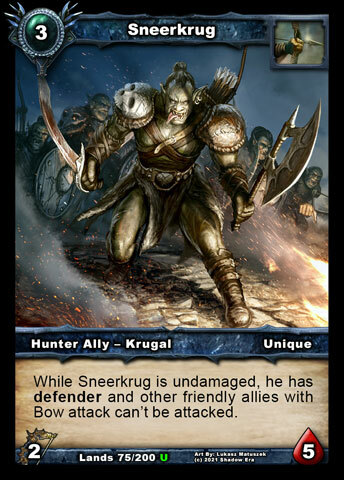 Other friendly allies with Bow attack can't be attacked while Sneerkrug is undamaged. Camouflaged Foe - 3cc Hunter Trap - Play face down. The next time an opposing ally is summoned, Camouflaged Foe becomes a readied Krugal ally with 3 bow base attack, 3 health and ambush, and it attacks the opposing ally if able. 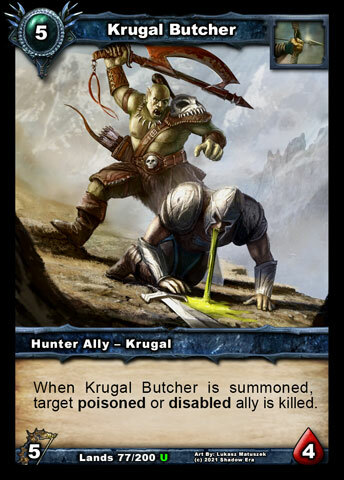 Krugal Butcher - 5cc Hunter Ally - Krugal - 5bow/4HP - When Krugal Butcher is summoned, target poisoned or disabled ally is killed. 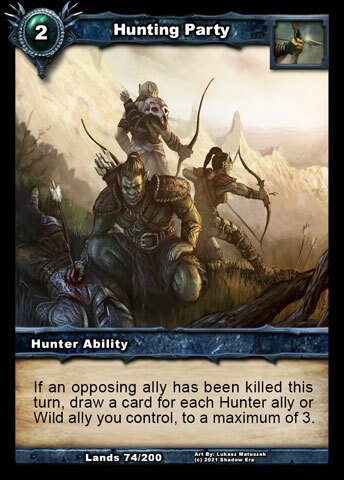 There's no prizes for guessing we're trying to push the idea of Hunter allies operating in a group - all seven of these cards either expand the pool of Hunter allies or has explicit interaction with them. 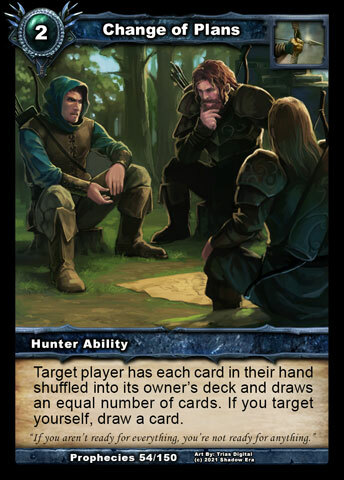 Beyond that, we've added cards that represent them working swiftly together as they hit the board, without resorting to haste - both Rain of Arrows and Hunting Party both show how an ally can be relevant even if it couldn't attack that turn. In a game where often players are looking for some immediate impact with their allies, we think these will be a great addition to the pool. Speaking of allies, the eagle-eyed amongst you will have noticed that all these new allies share a brand new alignment: Krugal. 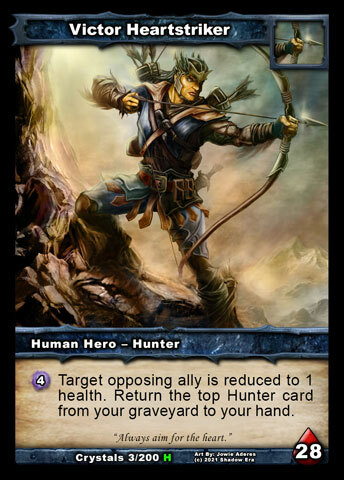 In terms of flavor, this race of bow-and-arrow specialists comes from a Shadow World, but their primal nature lends them well to being commanded by any Hunter hero. 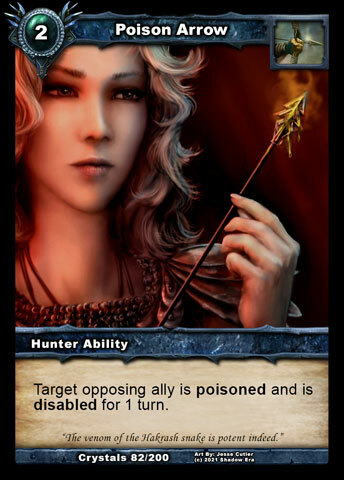 In terms of gameplay, since each of them is a Hunter ally with Bow attack, we have elected to key off those criteria rather than Krugal itself for now, which allows us to interact with Hunter allies from previous sets as well. On a related note, I'd like to confirm at this point that Skervox will be rejigged once Lost Lands Part 2 is released - his ability as a whole becomes grossly undercosted once these new allies are accessible to him. He will probably just lose the Hunter ally discount, but we want to take the time available before Part 2 is released to analyse him further before making a change to him. 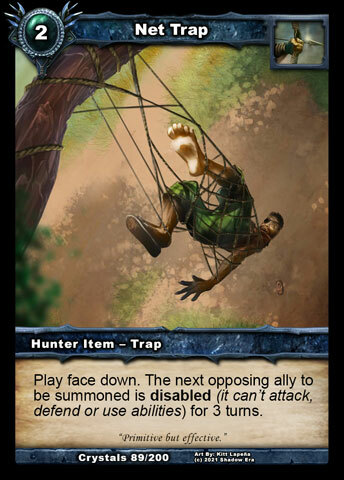 Returning back to these new cards now, I'd like to highlight our new trap, Camouflaged Foe , which brings our total number of 3-cost traps up to four (to match our 2-cost traps) and introduces a new style of ally play for Hunters where you can drop these to lie in wait for the opponent to play their own ally (as opposed to play to the board in the normal way where they might be dealt with more easily) and benefit from them attacking as soon as they are triggered. I'm really looking forward to seeing what players come up with to take advantage of this. Before I go, I'd like to refer to a discussion that happened on Telegram the other day, where someone mentioned that Change of Plans would become even less relevant if mulligans become standard. Krugal Lookout says "Ugruk!" (which means "Hi"). As with last time, I'd like to close by thanking you for your patience since Lost Lands Part 1 was released, and emphasise that we are revealing cards from Lost Lands Part 2 now without artwork to offer everyone a better opportunity to get involved with shaping their final form. Your feedback on how you think they will impact the game (whether that be their power level or fun factor or something else) and any ideas you have for their artwork are most welcome. Thanks for reading and I'll see you next time, where we will be casting our eyes over forthcoming additions to the Mage class. Last edited by Gondorian; 11-18-2016 at 01:32 AM. What happens if I have two camouflaged foes and opp casts viska, do both attack? Also "it attacks the ally" - opp has an ally and casts potl, I have 2x cf, one attacks and kills potl, does the 2nd one attack or what? OK, maybe that's a bad example because only I play Net Trap . Relying on the allies being kept on the board is quite risky, for sure, but this is an amazing amount of card draw and board control (for really cheap) the Hunter class is gaining if they manage to keep the board clogged. Having 4HP is also relevant for the majority of these new allies, it's kinda the magical number to survive most common sources of damage. I'd say these cards seem better than Warriors' selection, but for now only those 2 classes were revealed. I'm quite pumped for what's to come. i think if you are going to change skervox then just make it so only the first ally gets cost reduce. 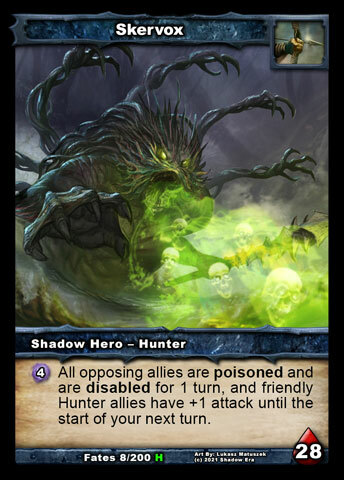 but i agree that we should wait and see because after all skervox ability is still very situational because you only get good benefit if the enemy has many allies on board and you have many hunter allies in your hand. Anyways, anyone wanna take bets on how long before someone says one of these things is OP? 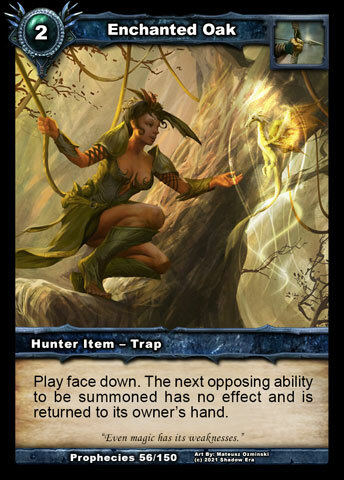 Otherwise, banebow Also loves these cards, ythan has been given some interesting new choices, and trap Victor has a few new tricks. Last edited by Umbra7; 10-19-2016 at 07:07 PM. Dejvo reporting to service. Lookout looks too cheap for what he does, he's basically a DMT (you always do at least 2 dmg cause you draw one card) which can defend itself and has sort of meek restriction cause he can deal only one damage to hero. Compared to 3cc DMT it seems very cheap, not sure if it is op. It's the number of cards drawn by that opposing ally's controller (i.e. the opponent), so it's 1 damage by default unless you can get them to draw some cards somehow on your turn. Another round for first impressions! 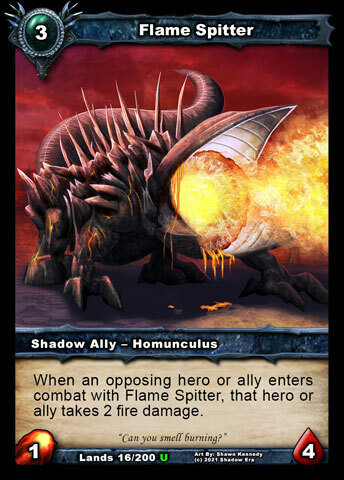 This seems like a pretty useful late game card (or early game if your allies stick) especially in combination with a weapon or damage ability (say banebow for example). It's also cheap enough to where you can play it and then haste in something like a Krygon. Even 2 alllies is enough imo (of course assuming you get more damage than you would from attacking normally, so all these cheap new guys should work great). Not to mention the psudo haste as the ally doesn't have to be readied to count. Thanks for the clarification, I too was confused by this one. 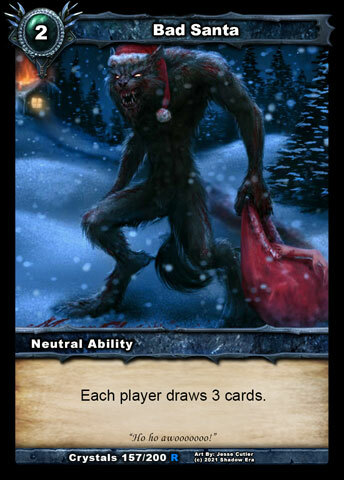 His high health is a plus for sure and his ability is great for decks that run stuff like Bad Santa or Loom of Fate. The synergy with Change of Plans sounds fun as well. A tricky one, but seems like a fun idea. 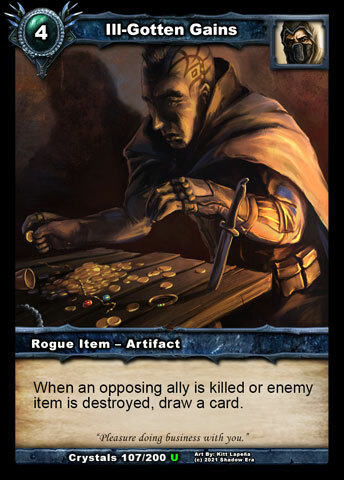 Adding the garunteed 1 damage also ensures that he will have some use even if your deck doesn't run a way to make your opponent draw cards (although it does work for things like Ill Gotten Gains triggering and the like too). Interesting mind games with this one, plays off the traps well since you have to reveal which one you sought. May make less used traps like Net Trap (although I've seen a lot of those lately for some reason x.x) and Enchanted Oak more popular because they can run few copies thanks to being able to seek them. DEFENDER! AND BOW ATTACK SYNERGY! (although poor Wendith T.T). The other part of the ability helps ensure that defender will matter more than usual. I like it, even if I'm not a fan of the low stats tied in with Unique. Camouflaged Foe - 3cc Hunter Trap - Play face down. The next time an opposing ally is summoned, Camouflaged Foe becomes a readied Krugal ally with 3 bow base attack, 3 health and ambush, and it attacks the opposing ally. On a related note, I'd like to confirm at this point that Skervox we be rejigged once Lost Lands Part 2 is released - his ability as a whole becomes grossly undercosted once these new allies are accessible to him. He will probably just lose the Hunter ally discount, but we want to take the time available before Part 2 is released to analyse him further before making a change to him. I still say his ability is very unfun because it disables everything. You could have it poison everything, disable one ally, and still keep some form of hunter ally synergy. Of course appropriate change to cost and what not, but his ability could be more interesting than stopping things for one turn. But I suppose that's just my opinion on him. Regardless, glad were keeping an eye on him in some way.
. Plz stop nerfs damn.